WEST Coast draftee Willie Rioli boasts a bloodline of football royalty, but it wasn't until he burned off the kilos that his AFL dream became a reality. Rioli became one of the feel-good stories of this month's NAB AFL Draft when the Eagles selected him with pick No.52. The 21-year-old was overweight and playing with the Tiwi Bombers in Darwin a few years ago. But after linking up with SANFL club Glenelg in time for the 2015 season, Rioli dropped a staggering 16kg to put his name in the mix for this year's AFL draft. The Eagles were in desperate need of a goalsneak, so they swooped on Rioli with their third overall pick. Rioli is the cousin of Hawthorn's Cyril Rioli and Richmond's Daniel Rioli. VFL/AFL legends Maurice Rioli and Ronnie Burns are his uncles. Talent is in his blood. But hard work is what ultimately won him a berth with an AFL club. "I'm way quicker than what I was with the kilos," Rioli said on Monday. "I'm longer in the game now. "I guess moving to the SANFL, the first couple of weeks of training were pretty hard. "I knew my stay at Adelaide wouldn't be long if I didn't change my weight and my diet. "I'm grateful I did all that stuff. I knew I had talent. But (I needed) to lose all that weight and play better footy." Rioli knows he's still got plenty of work to do on the fitness front. 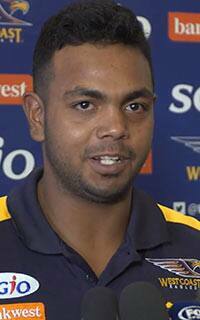 But here's some very good news for Eagles fans: "I play like Cyril," Willie Rioli said. "I always ask him for advice. My dad as well."